The other day on Twitter, Bryan A. Garner posted, “May I ask a favor? Would all who read this please use the prep. ‘till’ in a tweet? Not till then will we start getting people used to it.” I didn’t help out, partly because I hate pleas of the “Repost this if you agree!” variety and partly because I knew it would be merely a symbolic gesture. Even if all of Garner’s followers and all of their followers used “till” in a tweet, it wouldn’t even be a blip on the radar of usage. But it did get me thinking about the word till and the fact that a lot of people seem to regard it as incorrect and forms like ’til as correct. The assumption for many people seems to be that it’s a shortened form of until, so it requires an apostrophe to signal the omission. Traditionalists, however, know that although the two words are related, till actually came first, appearing in the language about four hundred years before until. Both words came into English via Old Norse, where the preposition til had replaced the preposition to. (As I understand it, modern-day North Germanic languages like Swedish and Danish still use it this way.) Despite their similar appearances, to and till are not related; till comes from a different root meaning ‘end’ or ‘goal’ (compare modern German Ziel ‘goal’). Norse settlers brought the word til with them when they started raiding and colonizing northeastern Britain in the 800s. 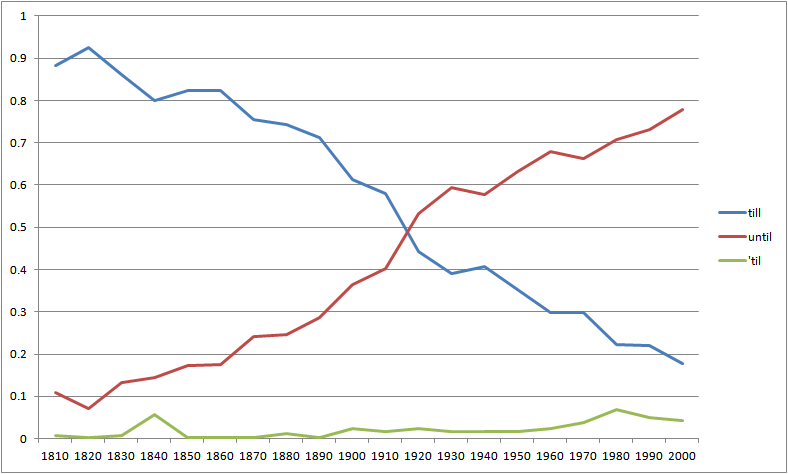 Mark Davies’ Corpus of Historical American English, however, tells a slightly different story. It shows a slight increase in ’til since the mid-twentieth century, though it has been declining again slightly in the last thirty years. 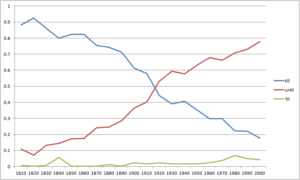 And keep in mind that these numbers come from a corpus of edited writing drawn from books, magazines, and newspapers. It may well be increasing much faster in unedited writing, with only the efforts of copy editors keeping it (mostly) out of print. This chart shows the relative proportions of the three forms—that is, the proportion of each compared to the total of all three. As Garner laments, till is becoming less and less common in writing and may all but disappear within the next century, though predicting the future of usage is always a guessing game, even with clear trends like this. Sometimes they spontaneously reverse, and it’s often not clear why. But why is till in decline? I honestly don’t know for sure, but I suspect it stems from either the idea that longer words are more formal or the perception that it’s a shortened form of until. Contractions and clipped forms are generally avoided in formal writing, so this could be driving till out of use. Note that we don’t have this problem with to and unto, probably because to is one of the most common words in the language, occurring about 9,000 times per million words in the last decade in COHA. By comparison, unto occurs just under 70 times per million words. There’s no uncertainty or confusion about the use of spelling of to. We tend to be less sure of the meanings and spellings of less frequent words, and this uncertainty can lead to avoidance. If you don’t know which form is right, it’s easy to just not use it. At any rate, many people are definitely unfamiliar with till and may well think that the correct form is ’til, as Gabe Doyle of Motivated Grammar did in this post four years ago, though he checked his facts and found that his original hunch was wrong. He’s far from the only person who thought that ’til was correct. When my then-fiancee and I got our wedding announcements printed over eight years ago, the printer asked us if we really wanted “till” instead of “’til” (“from six till eight that evening”). I told him that yes, it was right, and he kind of shrugged and dropped the point, though I got the feeling he still thought I was wrong. He probably didn’t want to annoy a paying customer, though. I think the evidence is pretty clear that, barring some amazing turnaround, till is dying. It’s showing up less in print, where it’s mostly been replaced by until, and the traditionally incorrect ’til may be hastening its death as people become unsure of which form is correct or even become convinced that till is wrong and ’til is right. I’ll keep using till myself, but I’m not holding out hope for a revival. Sorry, Garner. I am immediately going to search and replace all my untils with tills. Interesting to see the history of that. Up til (sic?) now, I was unaware of that. I agree that “till” must be dying out. For me, even though I am educated and fairly well read, my subjective gut reaction to “till” (as in the wedding invitation example) is that it’s wrong. Or at best, it “looks funny.” I would opt for “til” (and it doesn’t really need an apostrophe for me). Again, this is very subjective, so I’m being a bad linguist here, but I think the reasons for “til” conquering “till” might be twofold: a false impression (based on ignorance of etymology) that “til” is short for “until,” and more correctly corresponds to until’s single [L], coupled with the fact that “till” has as least two other common senses (cash drawer and plowing). “Till”, to me, seems archaic, about at the level of “thee” and “thou”. David Bowles: You’re a good man. Bill Davis: I think it just goes to show how far till has fallen when educated, well-read speakers are unfamiliar with it or think it’s an error. Interestingly, till ‘plow’ and till ‘until’ are etymologically related; both come from a word originally meaning ‘goal’. One sense developed into a preposition, and the other remained a verb meaning ‘work’ and eventually a specific kind of agricultural work. You can see how a phrase like “with the till of x” (“with the goal of x”) could eventually shorten to something like “till x” and how “I tilled my field” (“I worked my field”) could shift the meaning of the verb. Porter: I can see it sounding a little old-fashioned, but it seems weird to me to compare them to thee and thou, which died out about two centuries before till began to decline. Of course, once it’s archaic, it’s archaic, and we often mentally file all archaic things together. Excellent post. I had half a mind to blog about this, so you’ve saved me the trouble! The original questioner felt that till was skunked: that “enough people look at it and pause, which is undesirable”. I hadn’t realised it had sunk so low. It’s a shame. Like you, I’ll continue to use it. Another great post. I learned something new today, so thank you! I have not used “till” till now. I think I could see myself using it in poetry. Till then, I’ll just plow through life. I used to be a ’til-er, but I never felt happy inside, and would always replace it with “until”. Now I feel like I can safely say “till” while thinking “’til” and all will be well. Stan and Bob: That got me thinking: It seems like even though a lot of people feel skittish about using “till” (or “’til”) in print, it’s still fairly common in speech. And Mark Davies’ COCA bears this out. I don’t fully understand why it’s most common in fiction—possibly a combination of colloquial and slightly archaic literary styles—but it’s more common in speech than in magazine, newspaper, or academic writing. And the pattern holds for “’til”, too. I’m delighted that you brought this up! I grew up using till (b. 1955 in D.C.), and still use it, but often ran into resistance from teachers, especially as I was older. Fortunately, I also had one great teacher who corrected my use of ’til, and suggested till instead! I do see its use waning, but was amazed by your graphic. Astounding! I’m curious now to listen to my grown daughter’s speech to see if she picked it up from me. I occasionally have to explain till v ’til to intelligent people. Though you’ve depressed me into expecting it. In all honesty, till does sound archaic to me. I do think of it as similar to thee and thou. What you say is true, Jonathon. Once something is archaic, it doesn’t matter if it died out two centuries ago or two weeks ago. It’s gone. Wow. I’ve been using it all my life (b. 1959 in California) and never once thought it was archaic or obsolete. It never crossed my mind that anyone would look askance at it. A bit less formal, perhaps, but archaic? I too have been using “till” all my life (57, born in Tenn, now living in Maryland). I hear “till then” very commonly, too.